If you're looking for a nice hostess or housewarming gift, consider a tasty barbecue sauce. 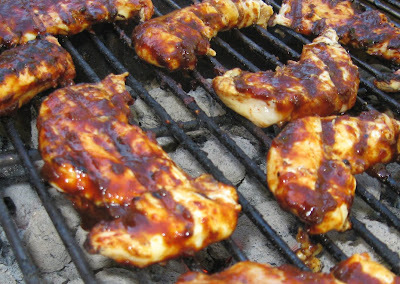 After all, everyone can use some good barbecue sauce even if they don't grill (though they ought to be thinking about getting a grill - for sure). Last night I went to a fabulous work party at a mansion. Seriously, the house had three kitchens and a back porch room looking back across 300 acres of prime land. It seems that a bottle of wine is the default bring along gift to a party, but I know the hosts always have plenty of nice wines (and certainly knows more about wine than I do). So, I went with what I do know - and that's grilling and barbecue. And, my pick from my sauce collection was Chef Hymie Grande. I order Chef Hymie Grande grilling sauce from Open Sky Yes You Can Grill Store, and it's a beautifully balanced barbecue sauce with great flavor and some excellent flavor notes. The idea of going with barbecue sauces when I am invited to gatherings came to me while reading Chowhound (a web site for foodies). They get into talking at these kinds of things. Some foodies ragged on those who showed up empty handed while others complained about people arriving wtih food or wine that did not mix well with the planned meal (and concerns that there was an expectation that what was brought had to be offered up at the gathering). Now, to me, a gift should be fun and not a worry. Since most everyone knows I'm big into grilling and barbecue, grill sauce just makes sense. But, it has to be excellent barbecue sauce and not from the grocery shelves here. I select something that I order online and that will be new and special. Chef Hymie Grande seemed a great fit for the party last night, but I also like to share Wild m Mild locally when I go to a party and know the host hunts of likes marinade and/or barbecue mops. Wild n Mild is fabulous on game meat but also on any type of meat. So, I put some thought into what I think is best for the host or hostess. 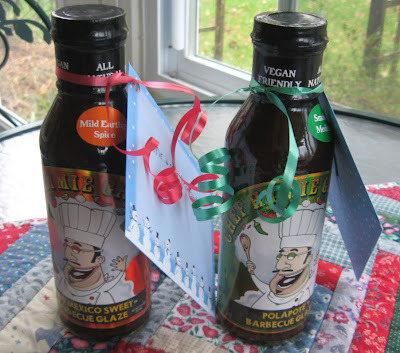 Finding the right size gift bag proves a challenge with bbq sauces as they are different shapes and sizes, so I usually just add a card and ribbon and the pretty barbecue sauce bottles take center stage. I hole punch the corner of the card and thread the ribbon and then use the scissors to make the curls. Below you'll see Chef Hymie Grande on some chicken. It's actually vegan and also carries the diabetic seal, so it works for your non meat eating friends too. And, yes, it does taste as good as it looks. It also bakes up fine in the oven for non grillers. Another of our favorites is Melanie's Big Acres gourmet sauces. She has some very interesting and delightful flavor combinations. You can even get a nice gift box with her sauces. So, all in all, I don't see how you could go wrong with sauce if you're trying to think of something a little different to give to a host of a party. They don't have to worry about whether they're expected to actually use the gift at the party. Somehow barbecue sauce does not go so well on finger foods (-: So, you know they get to enjoy it after all the work of hosting a special event.